Amanita citrina, often referred to as the False Deathcap (sometimes written False Death Cap), is an inedible fungus, although not reported to be seriously toxic. In any case great care is necessary because it is easily confused with deadly poisonous Amanita species such as the Destroying Angel. Found throughout most of Britain and Ireland, Amanita citrina is very common in some places. This species is also seen frequently across most of mainland Europe and is reported from parts of North America, where it is also quite common. 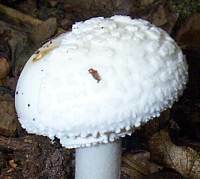 Jacob Christian Schaeffer described this mycorrhizal woodland mushroom in 1762 and named it Agaricus citrinus. (Most of the gilled mushrooms were included initially in the genus Agaricus, the contents of which has since been largely dispersed into many other newer genera.) 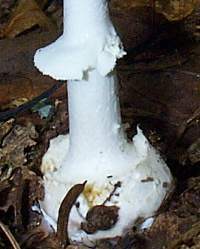 Christiaan Hendrik Persoon renamed this species Amanita citrina in 1797. Synonyms of Amanita citrina include Agaricus citrinus Schaeff., Agaricus mappa Batsch, and Amanita mappa (Batsch) Bertill. The specific epithet citrina is a reference to the lemon-yellow (citrine) tinge of the caps. 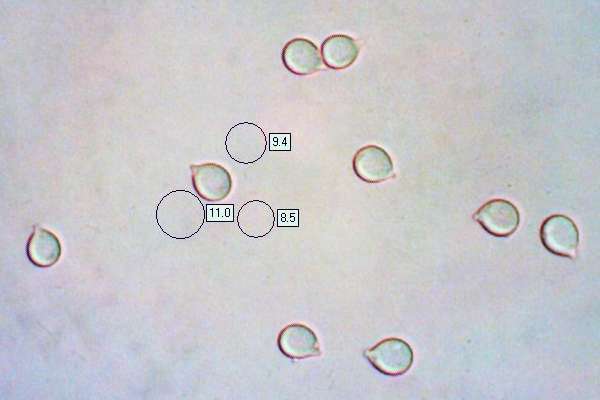 5 - 10cm diameter; usually lemon-yellow with large veil fragments that are brilliant white, as shown in the picture on the left. Initially rounded, the cap usually flattens at maturity. 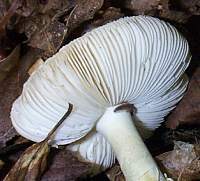 An all-white variant is also quite common - Amanita citrina var. alba (Gillet) Rea. The var. alba False Deathcap generally has a larger cap (up to 12cm diameter compared with 5 to 10cm for the more common lemon variety, and its stem is also white rather than lemon-yellow. Some authorities consider this to be a separate species rather than just a variety. The gills of Amanita citrina are white, free and crowded. White; typically 5 - 8cm long and rising from a very large, white volva that encloses an abrupt basal bulb. There is a gutter-like ridge at the top of the volva, which adheres to the stem base rather than forming a loose bag around the base. The large stem-ring of the False Deathcap hangs down slightly; it usually remains intact through to maturity. 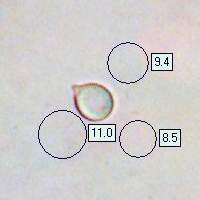 Spherical (or very nearly so), smooth, 6.5 - 10µm; amyloid. The flesh of young specimens of this mushroom smells rather like a cut raw potato (or, ssome say, like a cut radish); older fruitbodies, in my experience, often have very little in the way of a discernable odour. Ectomycorrhizal with hardwood and softwood trees but particularly often found under beech trees, Amanita citrina is very common in mixed woodland on alkaline or neutral soil. These attractive mushrooms seem to be much less common in areas where the soil is strongly acidic. 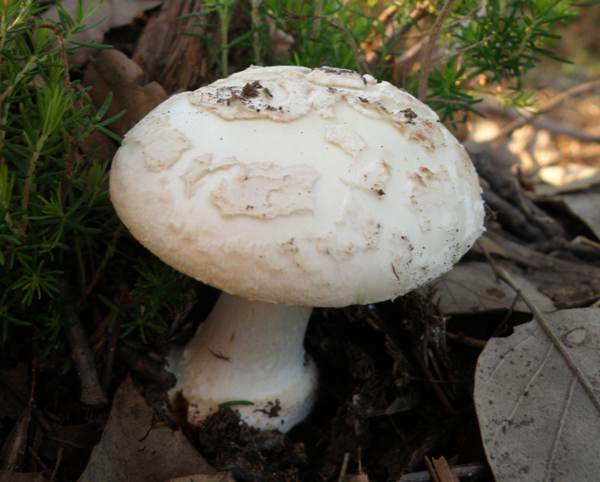 Amanita virosa, the Destroying Angel, rarely retains veil fragments on its cap through to maturity, the cap remains somewhat domed, its stem-ring is usually high up and not very substantial, and it does not have a sharp smell. Amanita phalloides, the Deathcap, rarely retains veil fragments on its cap, and it develops a sickly-sweet odour as it matures. 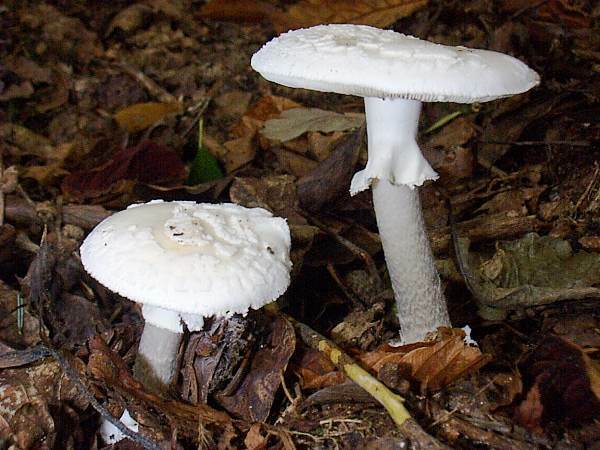 Amanita citrina is now known to contain the toxin alpha-amanitin; however, if eaten in normal amounts it is considered the concentration is so low that it is unlikely to have any significant effect on a healthy adult. 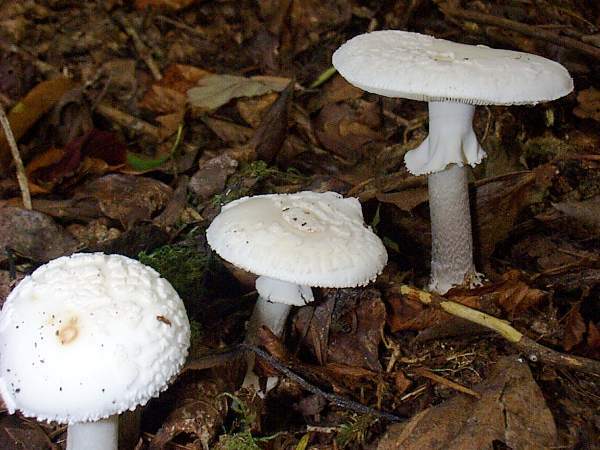 Of far greater risk is the possibility of confusion with one of the deadly Amanita species such as the Deathcap, Amanita phalloides, or the Destroying Angel, Amanita virosa. 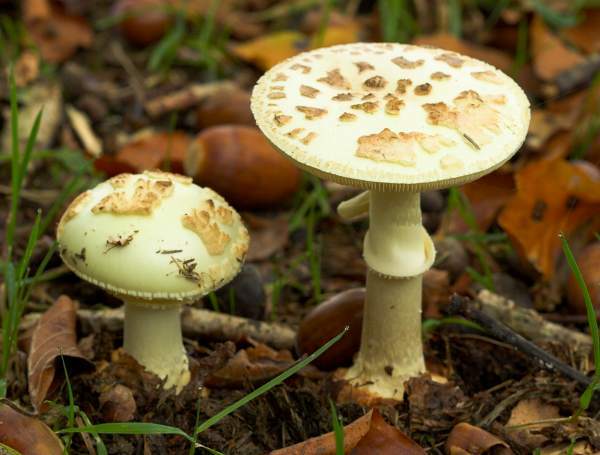 For this reason our advice is not to eat Amanita citrina, whether it is raw or cooked. The splendid False Deathcap shown above was photographed in Scotland's Caledonian Forest, where it is sometimes confused with the deadly poisonous Destroying Angel Amanita virosa, which is quite common in central and northern Scotland. (Amanita virosa is only rarely seen further south in Britain, where the False Deathcap Amanita citrina is much more common).